And though wildly quoted, few seem to acknowledge that Sartre never qualified this statement by claiming that solitude was any sort of heavenly alternative. 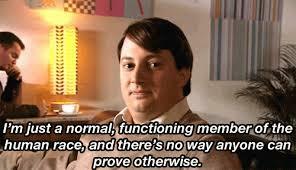 And it in this ambiguity and subjectivity on what defines heaven or hell that serves as a proper introduction to the British cult hit, and criminally underappreciated series Peep Show. Written by Jesse Armstrong and Sam Bain (In the Loop), the series first aired on BBC America in 2003, a few months following the finale of another British series you may have heard of, The Office. However, while the Ricky Gervais series, though overlooked itself early during its run eventually found a large audience and critical-acclaim, Peep Show has been unable to do the same at home or here in America. But what gives? Gervais himself believes the series is overlooked and underappreciated, stating 'It is the best British comedy on television today." The series revolves around the alternatingly humorous yet utterly tragic lives of odd-couple roommates Mark and Jeremy (played by British comedians David Mitchell and Robert Webb,) two 20-something roommates living together in South London. Mark, the relative protagonist of the series, is a cynical and pessimistic curmudgeon with a lightly unhealthy interest in World War II who works as a credit manager at JBL Credit. Socially inept veering into cringe inducing awkward, he is the straight-laced and quote unquote intelligent roommate who is usually brought down by his own paralyzing miscues and decisions. Jeremy, on the other hand, is an aspiring musician lacking any discernable talent, is the laid-back slacker who thinks that he and pal Super Hans are bound for musical fame. A pothead with a penchant for drug-induced mischief and an amoral streak, his life revolves more around trying to sleep with women then any sort of meaningful fulfillment. Though based on a deceivingly simple premise, what makes the show so unique is that it's shot via a first-person perspective. This point-of-view gives viewers a window into the world as precisely as the characters see it, and allows the use of voice-overs to express the inner monologues of the protagonists and lends the series a novel-like quality. As one of writers of the series himself puts it, "That's what makes the show work. People are able to, 'Oh, I'm not the only one who has unmentionable thoughts." The show's unique camera point-of-view not only differentiates it from every other sitcom in Britain or America -- it truly allows the viewers into the darkest, most awkward corners of the protagonist's minds. Yet it is the background of the series through which we really see these characters personalities. Be it either mundane everyday situations in the office, to the exaggerated and eccentric scenarios, the series is always grounded, given that anywhere an episode leads to is always found in a logical chain of events. Or rather, a series of unfortunate events that allows for a natural escalation of situations that ridiculous, yet anchored to reality. "I'm in a relationship with someone I really like. Something is obviously going to have to go wrong. I wonder what it's going to be. Its almost definitely something I do, I need to watch myself like a hawk." "It's almost like a moral decision, but not really because no one will find out." Though it's a bit pretentious to try to rope in a 20th century philosopher into an essay on the merits of a television show, the nature of the humor in the series lends itself to both the immature and the profound. 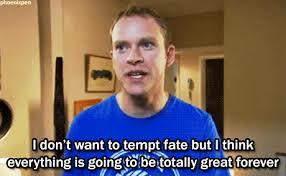 Peep Show uses its two main characters as embodiments of contradicting philosophies and then sets the pair off to stumble into whatever series of unfortunate events and self-inflicted hell they can conjure. And even as most British comedies find themselves delving into the darker vanities of human nature for laugher, this series fully commits to the most cynical perspective of human beings and an even more grim and pessimistic outlook on protagonists largely fruitless quest for love, fulfillment, happiness, success, or really, anything. 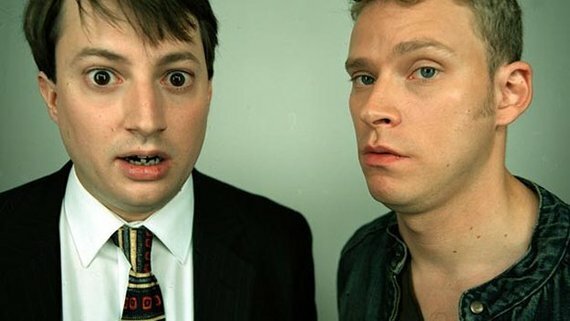 Peep Show is a comedy for our modern age, reflecting all our egotism, petty vanities, unstated truths, and vulnerability, all portrayed better, and more honestly, than anything else on television today. Given the show's decade-plus run is coming to an end later this year, and given the borderline offensive mediocrity that makes up most of television these days anyway, it's worth a watch. You can find all eight seasons of the show streaming on Netflix and Hulu.